Sanchon is a hidden oasis located in the Insa-dong neighborhood of Seoul. Fairly close to Gyongbokgung and Changdeokgung Palaces as well as Jongmyo Shrine, Sanchon is a great place to have a leisurely mid-day break during a day of cultural exploration or would make a fantastically relaxing end to one, I wish I had known about it to suggest to guests sooner. The restaurant itself is like being transported to another place, outside a major metropolis entirely. A number of the women I was with remarked that it was just like being in a temple in Thailand or other parts of South East Asia and I was inclined to agree. Cool, calm and airy it was like nothing I had experienced in Seoul. Even the smells walking in were nothing like other Korean restaurants. The two hours we were there both made me feel like I had always been there and passed in the blink of an eye. Truly relaxing and timeless. The owner is a former monk and the food is heavily influenced by traditional temple cooking. It sticks to being entirely vegan but breaks away from tradition by using the five pungent herbs (sometimes also called "five pungent spices" or "five pungent roots"). However, I've read that strict Buddhists or followers of Ayurvedic diet can request the meal be made without the offending alliums with at least twenty four hours notice. The lunch and dinner menu are both set menus and I would describe the lunch as having "four courses" but since it is traditional Korean food the courses were primarily made up of many small shared dishes rather than the plates you would be expecting of prix fixe Western menu. The first course had a fantastic combination of flavors and textures with both acorn jelly and a crispy puffed rice seaweed snack on the same plate. It also came with individual bonchon of cold glass noodles, water kimchi and a pumpkin soup. Everything has a very fresh, simple, clean taste. It was perfect after coming in from Seoul's already brutal humidity. I personally really loved the crispy seaweed and regret not buying a bag on the way out. I might head up there before we go to New York for some plane snacks. The next round was a large green salad tossed with red pepper, soy bean paste and rice wine as well a grilled mushrooms, pajeon (Korean pancakes) and squash slices that I think were fried with a very light rice flour batter.The red pepper paste used in the salad had the brightness of sambal more than the heaviness of gochujang and seemed like something I would make at home. Some of the other diners found the salad too spicy but I loved it. I think the simply prepared squash was the universal favorite. Part of what I really liked about Sanchon was the beauty and care that went into the presentation of each course. The third course, which was the "main" course was especially lovely with its huge assortment of kimchis, vegetables and tofu to put into your rice bowl artfully arranged in and around a basket. The rice is served in stone bowl and then divided into smaller bowls for you to mix ingredients and make your own sort of customized bibimbap. 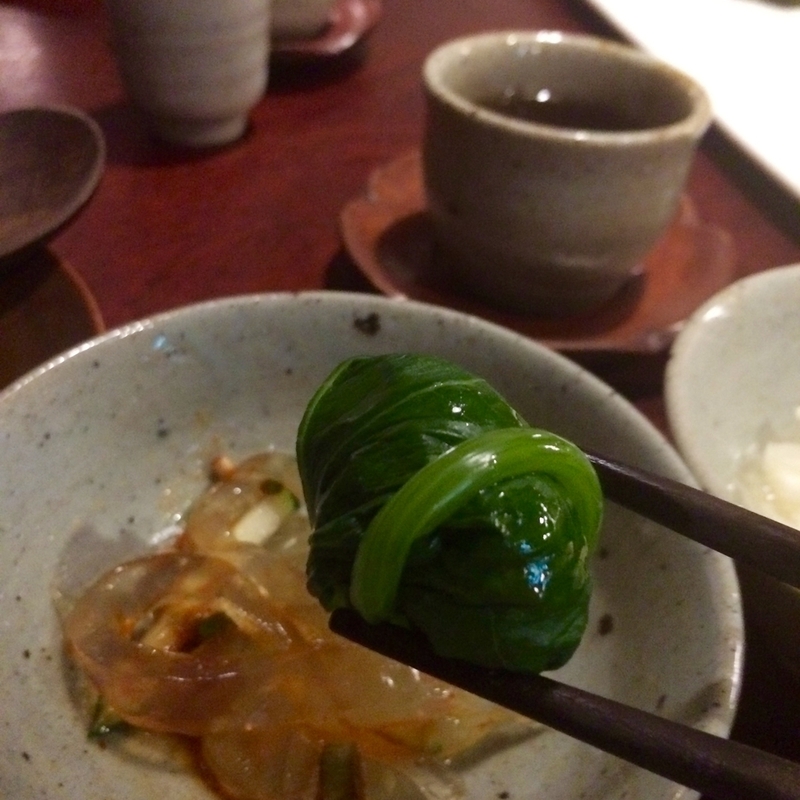 There's also leaves provided for you to make sambap (a sort of Korean lettuce wrap). Dessert was a simple assortment of lightly sweetened and dried (or maybe baked? ), sweet potatoes, regular potatoes and lotus root along with cinnamon tea. The cinnamon tea was extremely aromatic and much more delicious than I was expecting it to be (I don't have a good reason, cinnamon tea just didn't sound appealing to me). I think the lotus root was my favorite item on the plate and is another thing I wish I had purchased on my way out. I would easily rate Sanchon one of my top five meals in Korea and definitely my favorite cultural experience so far. It's somewhere I'll happily take future visitors but also probably won't wait for the excuse of having friends in town to go again. Sanchon is located here off Insadong Gil. It's tucked in a back alley but if you follow the signs, it's not too hard to find. You will be asked to take your shoes off upon entering and make sure you wear something comfortable since it's all floor seating.